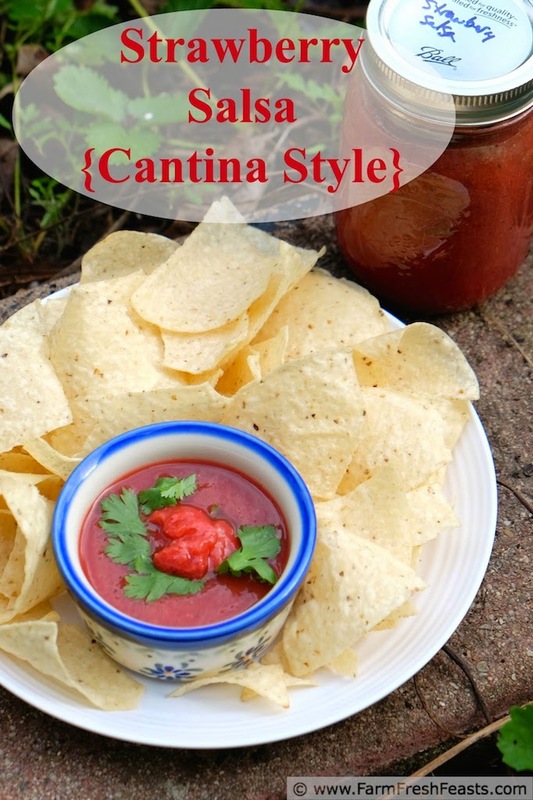 My spouse and I are getting into those super-thin tortilla chips--restaurant or cantina style--that go so well with the aptly named cantina style [liquid, not chunky] salsa. While we were out having margaritas last month I was mindlessly chowing down on that stuff. The deceptively small bowls make me not realize how often I was digging in--but it's so good! Don't get me wrong, I love a nice chunky salsa as well--those sturdy chips need something to do after all--and it's terrific mixed in with scrambled eggs, Taco Rice, oh the chunky salsa uses list goes on . . . I love my mindless snacking, though, and when that involves the sweet + heat that is this salsa, well, it's a thing of beauty. I thought this up while driving 500 miles home last week. I had 4 quarts of strawberries (tip o' the hat to AnnieRie for the Larriland suggestion) and a trash bag full of kale my dad had harvested from his garden. I also had Wee Oliver Picklepants as my only company, and his back is hurting so he wasn't saying much [hashtagmiddle-agedruntywienerdogproblems]. I also kept forgetting to switch CDs when I'd stop, and didn't want to flip through the selections while driving, so I pretty much occupied myself with thinking up strawberry and kale recipes all 8+ hours of driving. You've been warned. I was concerned about sending the wrong message about the visible rings in this photo-they are now off for storage. I knew I wanted to 1) use strawberries, 2) make a spicy salsa, using the last of the roasted Hatch chiles I picked up at my local grocery store and froze last August, 3) make a restaurant style salsa and 4) can my salsa, so I thought it would be a cinch to find a recipe in the Giant Recipe Book That Is The Internet. You know what? No luck. Sure--if I wanted a chunky salsa, a fresh salsa, or a sweet salsa for dipping with cinnamon chips I'd be set. But I had my parameters and I was stickin' to them. Off to my trusty library and Marisa McClellan's trusty Food In Jars cookbook. There, I adapted her peach salsa recipe--one that she says is essentially an adaptation of her tomato salsa recipe--to use what I had on hand. I also started it off in the blender because I knew I wanted a smooth salsa [and I'm lazy]. One nice side effect I wasn't expecting--the strawberry DNA [coolest 7th grade at home science project ever] thickens with the vinegar to make a salsa that clings nicely to the chip and doesn't slide immediately off like some restaurant salsas I've had. For more recipes using Hatch chile peppers, please see my Hatch Chile Recipes Collection. For more recipes using strawberries, please see my Strawberry Recipes Collection. These collections are part of the Visual Recipe Index by Ingredient, a resource for folks like me eating from the farm share, the farmer's market, the garden, the neighbor's garden, and great deals on ugly produce at the grocery store. Place clean canning jars in a pot of water and get this heating so it's boiling when you are ready to can. 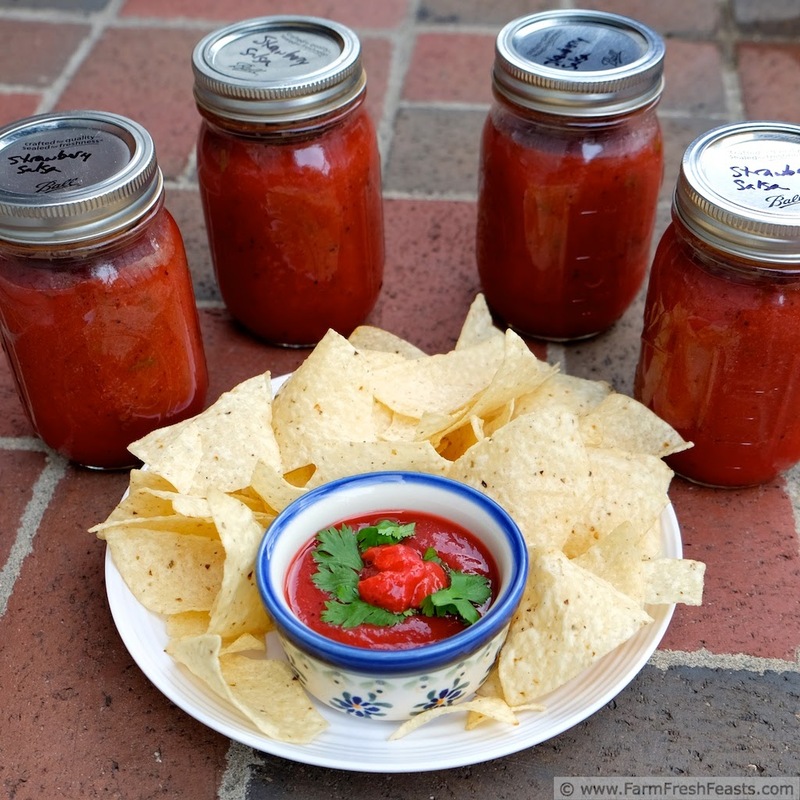 Or just plan to freeze or refrigerate this salsa--I imagine it would work fine too. Eat a couple of strawberries--my daughter did, so I know I didn't start off with a full 2 quarts. Place onion and strawberries in a blender (unless you want a chunky salsa, then just chop to your liking). Pour vinegar over top, and pulse a few times to chop everything together. Add chiles, sugar, and garlic. Blend thoroughly. Pour into a 3 quart saucepan, and stir in cumin and crushed red pepper. Bring to a boil over medium high heat, reduce heat, and simmer 10 minutes. Taste--see if you want more berries, more chiles or less vinegar. I wanted less vinegar--too bad so sad--so I ended up adding more strawberries which brought my total to nearly 2 quarts. Ladle into hot jars, leaving ½ inch headspace, and process in a boiling water bath for 15 minutes. For detailed canning instructions please refer to the National Center for Home Food Preservation. My husband had a spicy strawberry salsa recently, and he was very excited about it. Surprised that strawberries could be combined with spice so successfully. I'm glad to see your recipe for it, since I know he'd love me to make it. If you can combine mangoes and peaches with spice, why not strawberries? If you make it--it's not Hatch chile season right now so the cans of roasted green chilies would make a mild substitute, or grab and roast whatever spicy peppers are available. Or freeze some berries until the chile season starts? This sounds incredible. I love the combo of sweet and heat and how fabulous is it that you're the one leading the giant cookbook on the Internet in this category. Plus I'm thrilled strawberries are coming into season. Now to learn how to can. No biggie. Cough, cough. You know, if I could lead the internet in the category of Green Tomato Bacon Jam I'd be delighted. Google Personalized Search messes me up, though, gives me airs . . . Honestly, canning is not a huge deal once you do it, and you just need to come down and prepare to sweat in my hot kitchen. No squats or burpees or any of that, though. 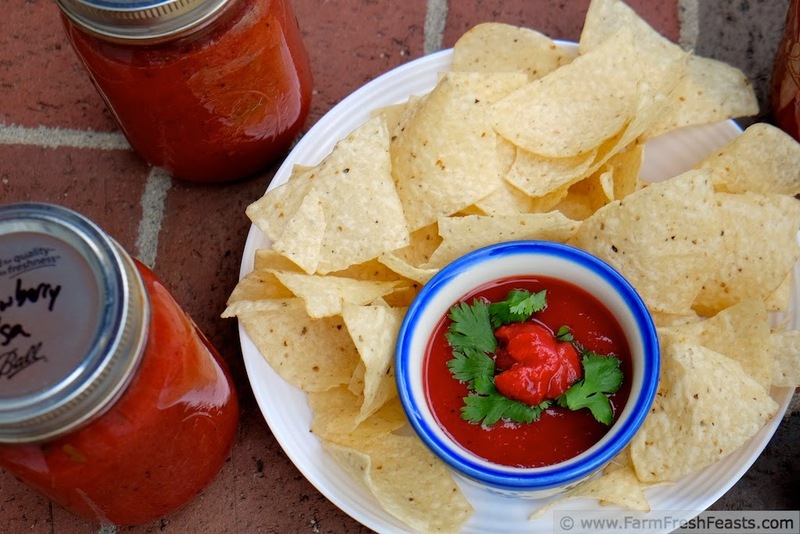 This salsa is interesting--and a refreshing addition to my salsa pantry (wow, I've got a salsa pantry). I definitely need to learn how to can this year. What a cool combination - I love the idea of strawberries with chilies! I bought a quart of strawberries at the farmer's market Saturday morning, and they barely made it to Sunday. I can't imagine how much I would need to buy to have enough to actually make a recipe! Worth trying, though. Thanks, Kirsten! The 4 quarts I picked up at Larriland were gone in a day. Then I sent my son to get another quart for some cakes for work. And yesterday I got 2 quarts in the farm share. So I think I'm ready to freeze some berries. Oh! We still have our patch! Kirsten, what can I say? This is one amazing recipe. To think I inspired it, with those strawberries. I only have a quart in the fridge. I need to find cilantro and Hatch chiles, but have all the rest. This may be Friday's project. On one of these trips, we have to meet for lunch at the Lisbon Town Grill, right off I-70, above Larriland. Oh, tomorrow sweet cherry season begins. I will be picking. Thank you for posting about Larriland--it's so convenient, minutes off I70, and the berries are delicious. Like I mentioned to Sherri--at this time of year I'd just substitute another spicy pepper (or 6) roasted. The grocery store a mile down the road gets in freshly harvested Hatch chiles and fires up their roaster in August, so I stock up then and freeze them for year round use. My folks are moving into DC, so I'm not sure if I will continue down I70 like I did to Leisure World or if I'll head down 270--but either way, lunch sounds lovely. Well I certainly don't have a cantina near my house that serves salsa like this, but if I did, I'd probably just move in there. This looks and sounds delicious! I've only had chunky strawberry salsas, which are great, don't get me wrong. This looks amazing though! 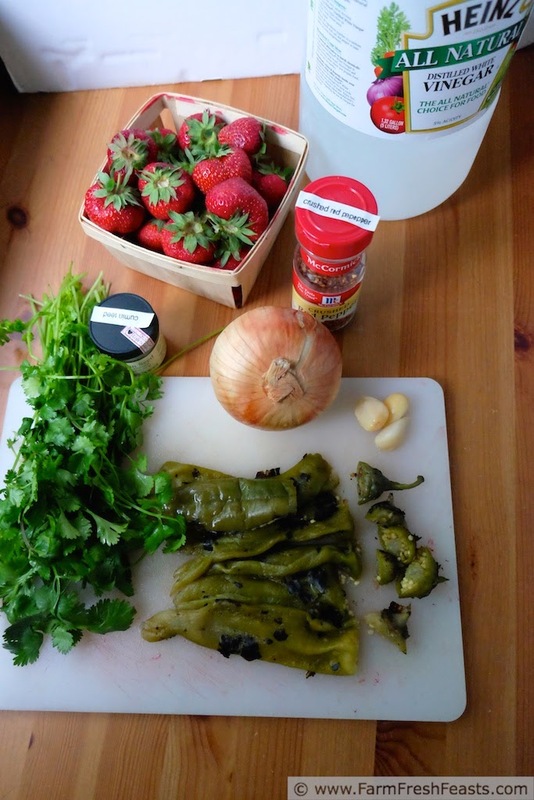 I've never had strawberries and hatch chiles together, and I'm loving that idea! I don't think you'd want to move into a cantina--I mean, when I worked in restaurants the grease just seemed to get into everything, and the hours the place would be busy . . . just sayin' . I think I'm out of my frozen cache of roasted Hatch chiles, though, so minor sadness here. I need to defrost the fruit and veg freezer to confirm though. We had our first strawberry haul from the backyard patch yesterday. And by we, I mean my daughter did the work and I just popped a berry into my mouth. I suppose this is one instance that size doesn't matter. I think I'm glad I canned this in pint containers, because if it were in half pints we'd just eat the whole thing in one sitting! Thanks for co-hosting Fiesta Friday! What a brilliant idea! 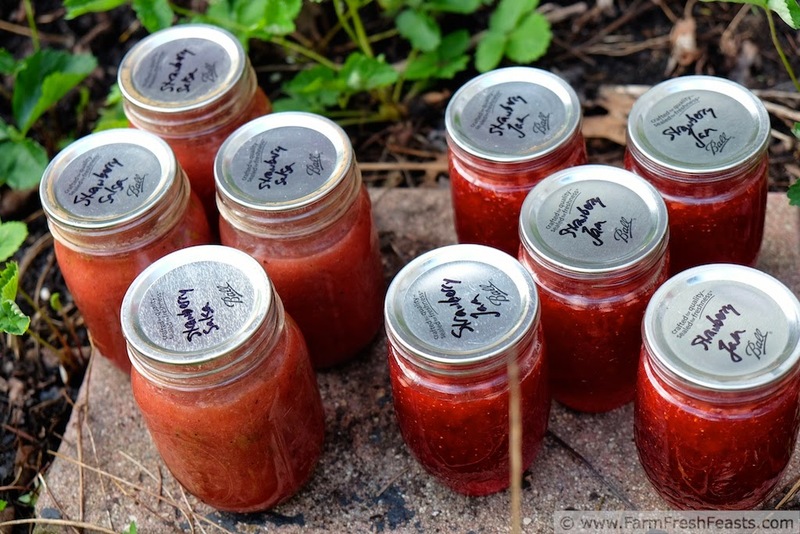 I love the thought of fresh salsa with strawberries. You are so clever! 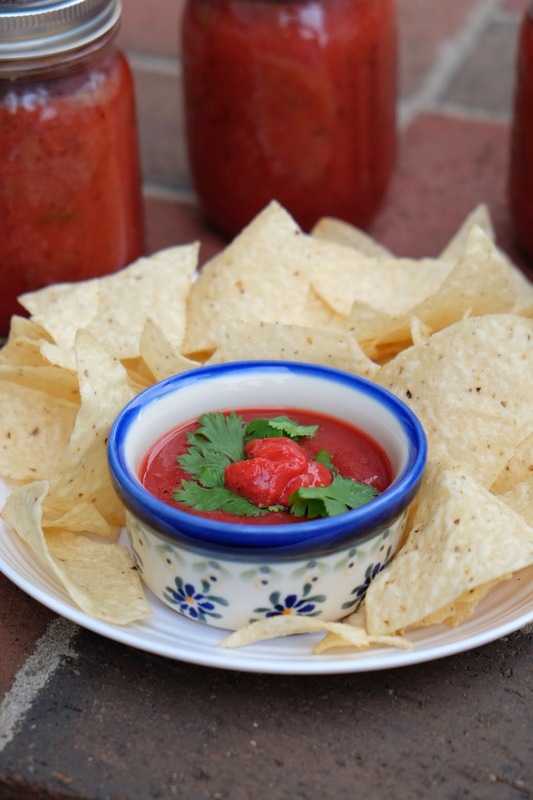 Spicy salsa with sweet strawberries works well for me. strawberry salsa? loving that idea! thanks for bringing it to FF20! You're very welcome--you brought the chips, right? Cuz I always forget to bring chips. Found your strawberry salsa! I may play with the chiles (jalapenos instead of hatch), but I think I may try this with my freshly picked strawberries. I think jalapeños would be a terrific sub, especially since I'm out of Hatch myself. It'll be August/Hatch chile season soon enough--meantime, my garden pepper plants are . . . still alive, though I don't see any peppers on them. Kirsten this is awesome! I'm SOO excited to try this as soon as our strawberries are in!! You must share this! I hope your strawberries come in soon--and that no varmints take a bite out of each and every one before you can harvest! I've never tried watermelon salsa--that sounds wonderful! My spouse is decidedly NOT a rhubarb fan so I never seek it out, though I think a strawberry rhubarb salsa sounds pretty tasty. I never knew such a day existed! I love food holidays. Helps keep things interesting. Thanks for the feature--great idea you two! hi! I'm not sure if you still check these comments, but I was thinking that I'd love to try adding some lime juice to this recipe--but I'm afraid to tinker with a canning recipe as I'm new-ish to canning. I guess ADDING acid couldn't hurt--the danger is more in not having enough acid, right? Thanks! I like the idea of strawberry + lime, it's a terrific flavor combination. My guess same as yours--adding additional acid couldn't hurt--though I've not tried it.